Red Army soldiers return to Lemberg, July 1944. Source: Wikipedia. 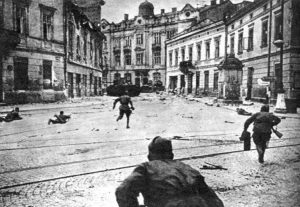 On the 17th of September, 1939, the Soviet Red Army invaded Poland from the east, and rapidly spread westward; by the 6th of October, only six weeks after the Molotov-Ribbentrop Pact, the Soviet Union and Nazi Germany divided Poland between their forces, and the Second Republic ceased to exist. The Soviet Union held eastern Poland until it was betrayed by Germany in Operation Barbarossa in June 1941; the Axis powers then took control of eastern Poland and much of the land eastward to Moscow, until the Red Army was finally able to push the Axis forces back in the second half of 1944. 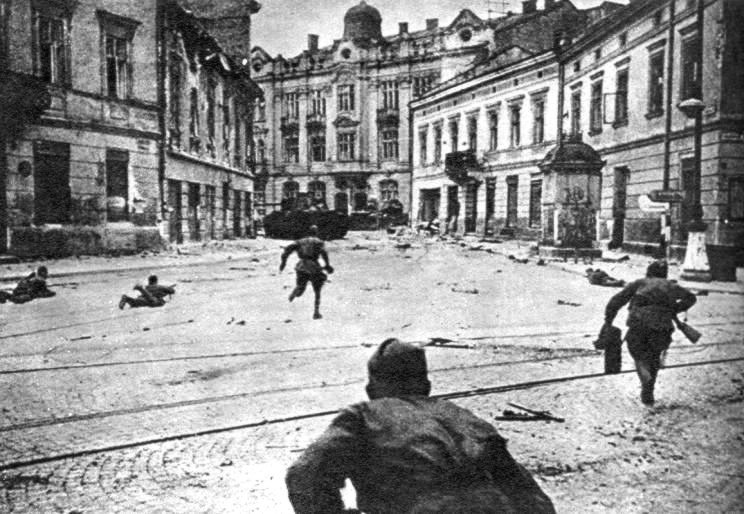 Rohatyn, Lwów/Lvov/Lemberg and the other cities of the region were subject to alternating occupations, and many cities suffered damage. The toll on the residents of the cities was of course much worse. During the less than two years that the Soviets held eastern Poland from the start of the war, engineers for the Red Army surveyed the land and began producing maps for military and future administrative use. The map shown here, numbered M-35-86-B but hand-revised to C, was based on surveys from 1940 but this first edition was not printed until 1943, when the Soviet Union had already lost command of the region. Designed and drafted at the relatively high scale of 1:50,000, the map clearly shows details of the city of Rohatyn and its surrounding region; this is the clearest topographic map we know of the region immediately around Rohatyn. The map heading declares it to be produced by and for the Генеральный штаб Красной Армии (General Staff of the Red Army), and of course restricted for official use only. Labels and symbols on the map follow the Soviet topographic map system developed before World War II and documented in U.S. Army Technical Manual TM 30-548, a 60-year-old aid still useful in Soviet map interpretation. It may be of interest to compare this early Soviet map to the 1978 topographic map elsewhere on our website. The 1943 map image below is interactive: pan and zoom are available with ordinary mouse controls or gestures, depending on the device, and zoom is also available by the +/- buttons in the upper left of the display. The map can be made transparent in 10 steps by sliding the control in the upper right of the image. This 1943 topographic map is one of a series of historical map overlays included in the project Mapping Rohatyn: Geography as an Education Resource.